Chicago photographer Tonika Johnson has garnered a lot of attention for two projects that are both focused on the South Side neighborhood where she grew up, Englewood. To outsiders, Englewood is often considered a scary place, a place at the epicenter of Chicago’s crime problems. To be sure, Englewood has its issues with crime and violence but that does not define the experience of many of its residents, including Johnson. For her, Englewood is a place where kids play, couples hold hands and walk down the sidewalk, and families love each other. She doesn’t deny that for some the narrative put out by the evening news is their reality, but knows there is a lot more to Englewood and its residents than that. 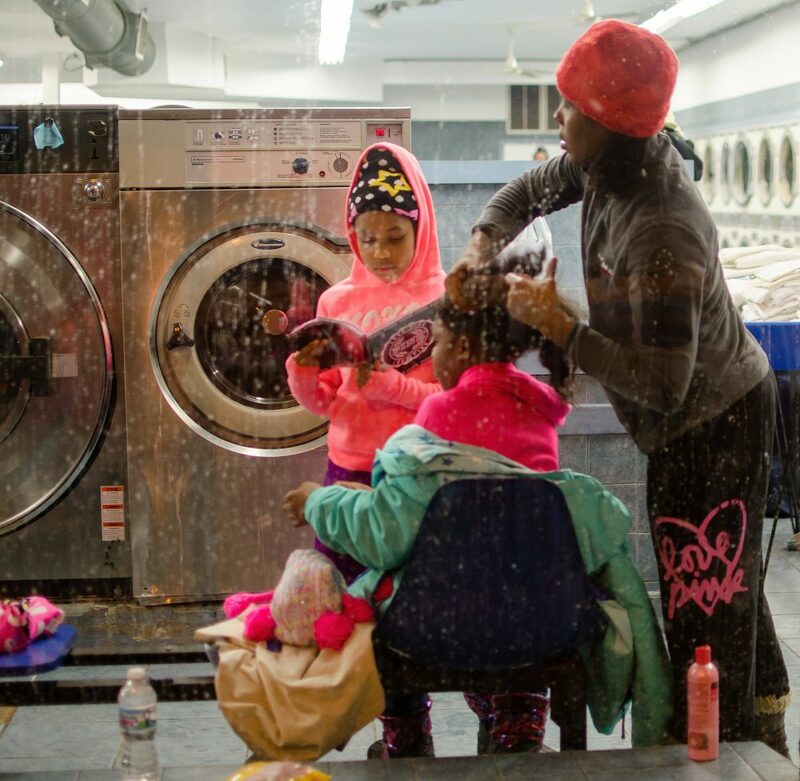 Johnson said she did not set out to make a statement with either project — “Everyday Rituals,” which just ended a run at the Root Work Gallery in Pilsen, or “From the INside,” now on display at the Harold Washington Library; her goal was just to shoot her neighborhood. But the reaction to both projects has taken a life of its own, in a positive way. Because of the attention to her photo projects, making a social statement is now something that she is more aware of and something that she intends to do going forward. 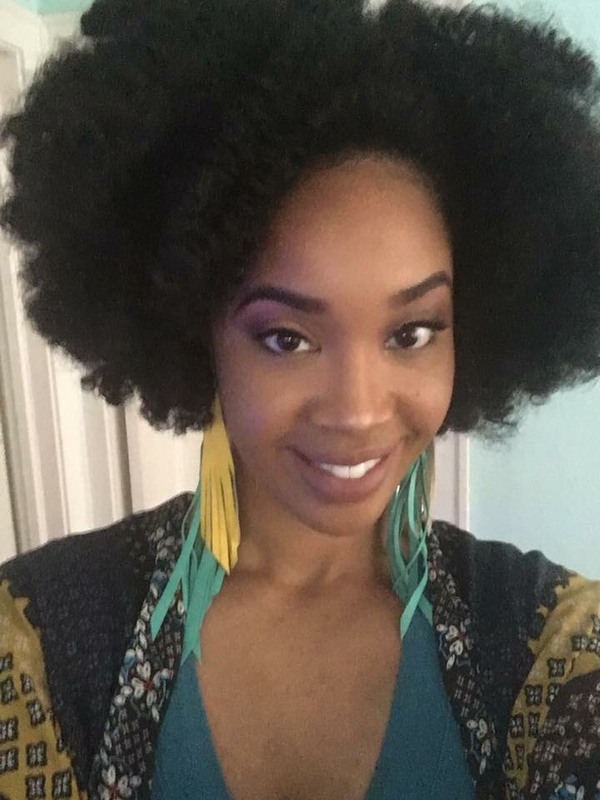 Johnson also wants to use the attention she’s getting to encourage young African Americans to pick up cameras and document their own experiences and inspire them as she was inspired by Pulitzer Prize winning photographer Ovie Carter when she was in high school. Johnson said she met Carter when she was attending Lane Tech College Prep across town and inspired when he told her she had a great eye after seeing her photos. Carter would become a professional mentor to her and also introduced her to the work of John White, another Pulitzer Prize winning African American photographer. Johnson said she asked Carter if she should major in photography in college and he advised her to get a degree in something to prove to people that you can write, telling her that she was “already a photographer.” It was advice that she followed, graduating from Columbia College in 2003 with a major in Journalism and a minor in photography. From there, she went on to get her MBA at National Louis University in 2005. When she’s not taking photos, Johnson is caring for her 16-year-old daughter (who also attends Lane Tech) and 12-year-old son and works as the program manager at Growing Home, a nonprofit that provides employment training and organic produce to communities throughout Chicago. The Chicago Ambassador’s Bob Chiarito recently met with Johnson at Kusanya Cafe in Englewood to discuss stereotypes about the neighborhood and her photography. CA) I asked a variety of people I know from varied backgrounds, social classes, ethnicities and races and neighborhoods this question and prefaced it by saying: There or no right or wrong answers: What is the first word or thing that popped into your head when you think of this neighborhood: Englewood. Gunshots. Violence. Derrick Rose. Pain. Holmes ( as in H.H. Holmes). Basketball. Police. Southtown Theater. Dicey or iffy. Drive-by shooting. HH Holmes. Whole Foods. Five decades of failed public and social policies. Chain link fences. Opportunity. Murder. Guns. Gangs. Whole Foods. Crime. Rebounding. Liveshot (as in television news). Teenagers. South Side. Striving. Bad. Crime. Sad. Sadness. JOHNSON) That’s interesting because I do an similar exercise with students where we compare North Side and South Side. I like that idea because I’m going to be on a panel discussion and I can use that, ask people what words come to mind. CA) There were a few positive (D.Rose, basketball, opportunity, Whole Foods, Southtown Theater, Striving, Rebounding) a couple in the middle (teenagers, South Side, chain link fences) but 19 of the 29 were definitely negative. Does that go along with what you’d assume people would say? CA) It sounds like that’s one of your goals, to change perception. JOHNSON) It’s interesting because it’s my mission now but it wasn’t when I started the project. As an artist, it wasn’t my mission. As an artist and a photographer I was just taking pictures of my neighborhood. I didn’t set out to change any perceptions but what happened is that when I started to share my work with my friends in the neighborhood, a lot of people reacted in a way that made it clear to me that my project had a larger purpose. Even though artistically it wasn’t my intent, when people have a reaction to your work you have to really analyze it. I knew about the preconceptions but once I did the project I realized this was a little larger than myself. The fact that everyday life is news in Englewood is a little disheartening, but the fact that so many people reacted positively is great. It was really the community that was most important to me because we don’t get to see images of ourselves like this. CA) What are the differences between “From The INside” and the “Everyday Rituals” projects? 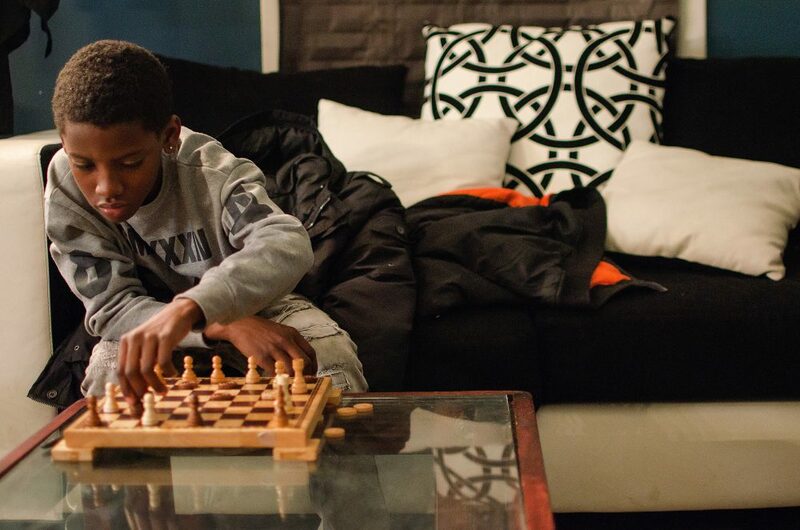 JOHNSON) For me, artistically “From The INside” is photography from everywhere [in Englewood]. With “Everyday Rituals,” I thought about where I wanted to shoot for the exhibit. It wasn’t so much street photography as it was thinking about the rituals people do in the community. 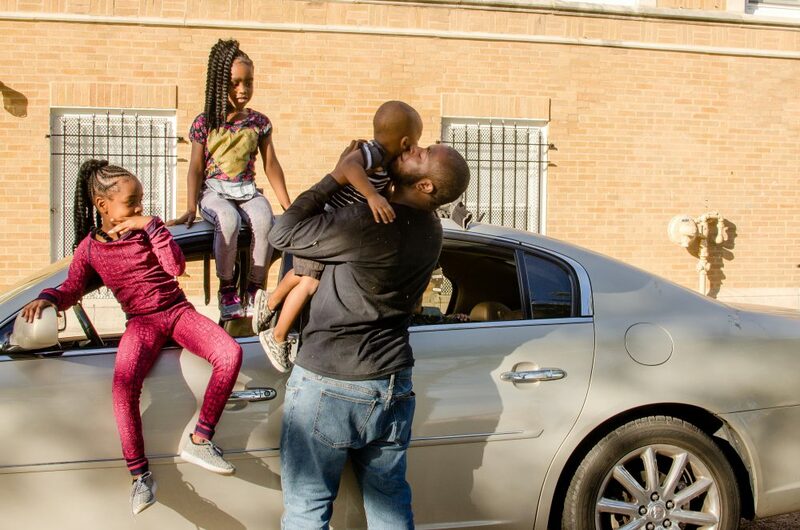 “Father” – one of Tonika Johnson’s images of life in Englewood. CA) You said when you did “Everyday Rituals” that you did not set out to create a social commentary. Going forward, is making a statement something that you want to do? JOHNSON) Yes, and right now I have three new projects in my head. CA) It’s kind of a commentary in itself that everyday, normal stuff in Englewood is getting attention. JOHNSON) Really what drove me and kept me going with the project was the community, how much of a difference it was making. CA) You did not ignore the violence, you have a picture of a memorial but you didn’t focus on the violence because that type of thing may not be the majority of your experience in Englewood, correct? JOHNSON) The problem is sweeping generalizations. There are people here who experience that but that’s not everybody’s truth. It’s not respecting the diversity in the neighborhood. CA) Like this place [the coffeeshop]. I see whites, Latinos, blacks and they are playing Radiohead on the stereo system here. That doesn’t fit the stereotype. JOHNSON) Right. There are people who live on bad blocks but people who don’t experience much of that. I want to respect those who are going through that experience, but to have that be the complete narrative of the neighborhood isn’t fair. CA) I think a lot of times with the TV News, they only have a small amount of time so they quote one person and they are looked at as the voice of the community. I don’t think anyone can speak for an entire neighborhood. JOHNSON) Even myself, someone who grew up in Englewood. Some would be surprised to know that I’ve never witnessed someone get shot. Englewood and West Englewood is one of the largest neighborhoods in Chicago so the experiences are very diverse. CA) A lot of people think of Englewood as a place filled with moms who can’t let her kids go outside because of the gunshots. JOHNSON) And that is the reality for some people, but it’s also not the reality for a lot of people. I played outside. What really made me to realize it was ok for me to be a representative of changing the narrative was when I realized the impact stereotypes can have on investment. People say ‘Oh it doesn’t matter it’s just what people think,’ but the reason it matters is because it ultimately determines if people want to invest in the neighborhood. JOHNSON) But it was a big deal because of the stigma. So that made me realize why changing the narrative is important. If my art can be used to help change the narrative and make people realize that it’s more positive than they actually thought, then I’m fine with that. CA) How important is it that you’re from here doing this rather than someone from outside Englewood coming here and doing what you have done? JOHNSON) Oh, it’s really important and I’m a huge believer in having people from here be a part of the documentation of it. I don’t care how great of a documentarian you are, whether it’s journalism or photography, you’re not really going to have the cultural and geographical knowledge that someone from here would. As a photographer I’m desensitized to some of the aesthetic things that someone from outside Englewood might focus on and I’m able to actually focus on people. CA) It probably helps — even if they subjects don’t know you, when they find out you’re from the neighborhood they may trust you more than someone who isn’t. CA) I’m not a photographer and I can walk around and write without bothering anyone. But photographing people always seemed more intrusive. JOHNSON) It is. You have to decide how you’re going to handle it. CA) Well, if I’m talking to someone as a reporter it’s different. I obviously have to have permission. JOHNSON) Yes, but they know what they said. They might not know how you’re going to use it in the story but with photographers, they don’t know how they are going to look in the pictures. More trust is needed so creating trust is really important. CA) If someone is on the street do you take their pictures before you ask them? JOHNSON) It depends. If they are part of a scene that I’m trying to capture than no. CA) Because you don’t want to ruin the spontaneity. JOHNSON) Exactly. But if it’s something more focused on them I’ll ask them and I’ll give them my card, that helps. CA) The Everyday Rituals exhibit paired your photos with the art of Adrienne Powers — did you know her before the exhibit? CA) The curator put you together? JOHNSON) Yes. She had a vision and it worked. I didn’t understand the connection at first but I got it when I saw it. CA) Was it easy for you to decide what and who to shoot? JOHNSON) Yes. But I didn’t really have a strategy. I see stuff all the time. CA) Do you usually have a camera with you? JOHNSON) I used to always carry my camera around but it interrupted life so much, I had to decide. The From The Inside project was created when I always carried my camera with me. But later I decided to leave it at home so then I’d have to set aside time to photograph… Sometimes when I had my camera with me I’d be out with friends and would completely ignore them. Me having my camera completely changes how I interact with people. CA) I know what you mean. Sometimes I feel like I never turn off. JOHNSON) I went to Jamaica for the first time a couple years ago and I chose not to take my camera, that was a difficult one. CA) Oh wow, you must have been dying! JOHNSON) Yeah. But I knew that I wasn’t going to have the time I wanted to really get shots that people hadn’t seen in a certain way. I would have been taken touristy shots and I really didn’t want to do that. CA) You didn’t want to take postcard pictures. CA) That’s interesting to me because I think most people who go on a trip take pictures for themselves, but you were thinking about your audience. JOHNSON) Not even my audience, it’s really me — what I want to see. I’ve seen enough of those postcard pictures. I want to take pictures that have an emotional impact for myself. “From The Inside” will be on display on the 8th floor the Harold Washington Library through June 4th. Click on the photos below to see a few more of Tonika Johnson’s images.